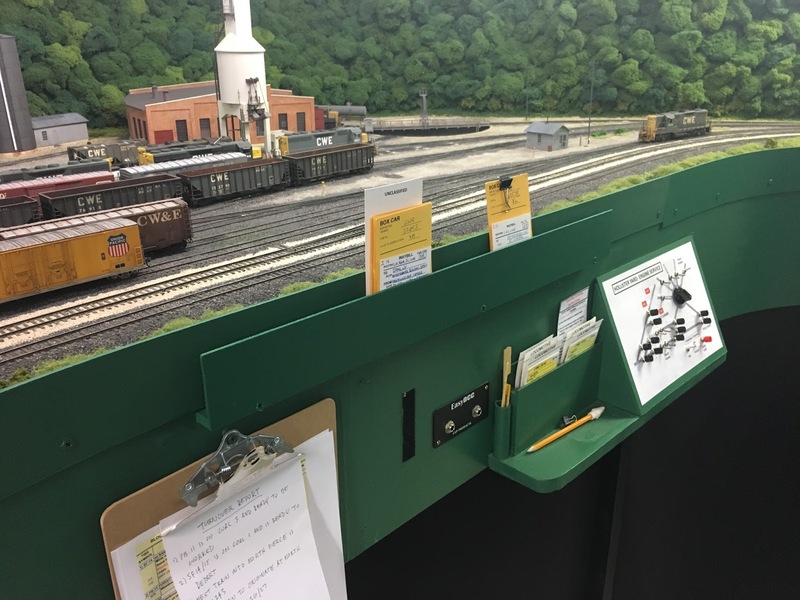 During the operating session yesterday, we ran X-1824 which is the MOW ballast train that runs from New Market, VA (east staging) through to Morgantown, WV (west staging). This train has run numerous times in the past, albeit with different power, and we've never had any issues. At least until yesterday. As the train entered the siding westbound at Summit Springs for a meet with EC-2, the loco stopped on the grade crossing. The crew called the super to inform him that we had a problem. Sure enough, the loco was hung up on something. This was the first time this unit had been in service, but it had been across the entire main line and though most of the yard without any problems. So we pushed the unit past the grade crossing and the train left Summit Springs. Shortly thereafter, the crew told me that the train had stopped in the tunnel between Summit Springs and Cedar Falls Junction. Now this was becoming infuriating! I crawled under the railroad and one of the ballast hoppers had derailed. I pulled the car off and we got the rest of the train back together. Fortunately, the train then made it to Morgantown without any additional issues. These kinds of problems drive me nuts because they don't have to happen. With some time and effort, and a little bit of care, you can achieve almost flawless operation provided you have reasonably good equipment and track. So after the session I backed train up to Summit Springs to sort out the problems. As the train entered the tunnel between Cedar Falls Junction and Summit Springs, the ballast car derailed again. So I pulled it off and set it aside. The train was then run back and forth several times through the same section of track without any additional issues. So it was off to the grade crossing at Summit Springs. Sure enough, the loco got hung up again. The photo below shows the offending loco and grade crossing. 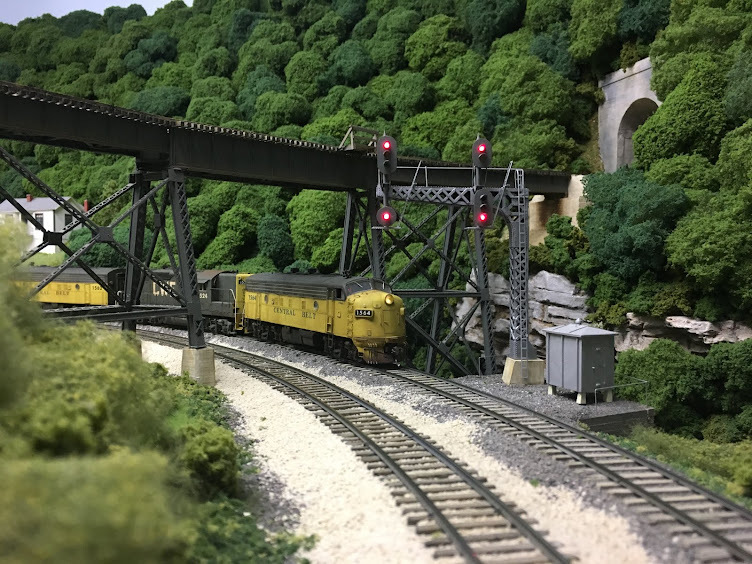 Keep in mind that we have run many different locos through this crossing over the years and none have ever had any problems. So I figured it was an issue with this loco. 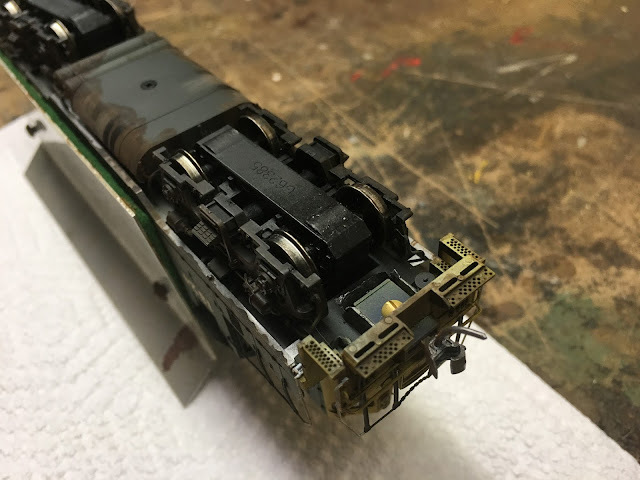 I removed some of the grout from between the rails and it made a small improvement, but the loco still stopped. So I took the loco back to the shop to see if it was a wheel gauge problem. The photo below shows what I found after I turned the loco over. Note the bumps on the bottom cover under each axle. This is an Athearn Genesis chassis with a Proto 2000 shell on it. I assume these bumps are to accommodate the gears on the axles. I'm fairly certain that none of the other manufacturers' units that I have on the railroad have trucks that are designed this way. In any event, these bumps decreased the ground clearance just enough to cause the unit to hang up on the grade crossing. After removing some more material from between the rails, the unit passed over it without any issues. As for the ballast hopper, this car had traversed the railroad numerous times in the past without issue. A quick check of the trucks, however, revealed the problem- the car had code 88 wheelsets. I bought the car used and didn't notice this when I painted and lettered it. The photo below shows the difference between the code 88 wheels and the code 110's that have replaced them. 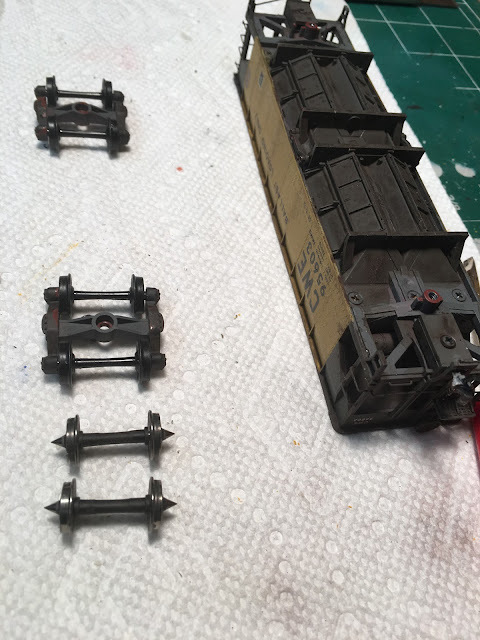 All of the track on the railroad is hand-laid and there's just enough variation in gauge that code 88 wheels will give me problems periodically. That's why I have standardized on code 110's for all rolling stock. I had this same problem with a covered hopper car that I bought used and it gave me fits until I figured out that it had code 88 wheels on it. Lesson learned. The hard way- again. Fortunately, the problems were found quickly and the fixes are easy. I'm just disappointed that they cropped up during the session. Here's one last shot of X-1824 holding the siding at Summit Springs. And when it proceeds west this time, it will run the way it was meant to! 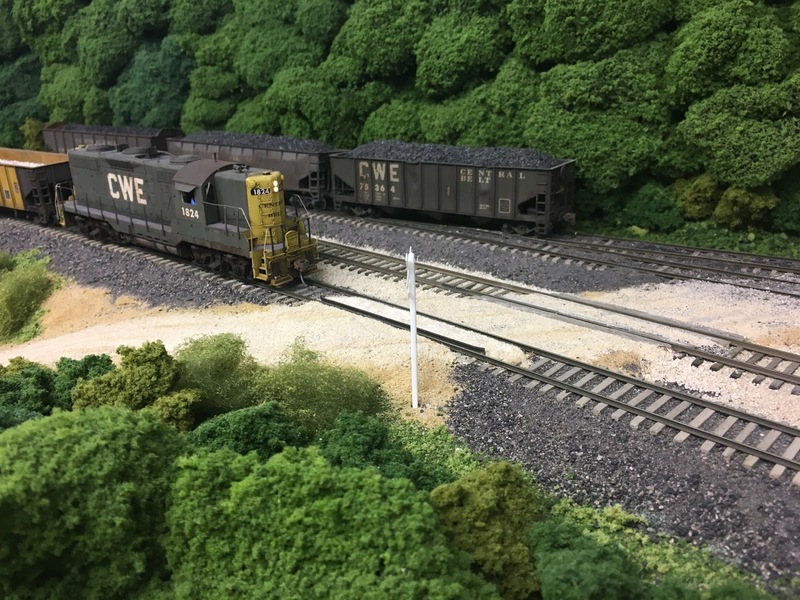 As I mentioned toward the end of Part 1 of this post (https://cwerailroad.blogspot.com/2018/02/the-engine-terminal-at-north-pierce.html), I had found photos of the C&O roundhouse at Hinton, WV on Bill Simonson's website. The brick colors were exactly what I wanted and I studied that photo for a long time in an effort to come up with some techniques that might work. The Walthers three-stall roundhouse comes molded in a muted red color that appeared to be a good starting point for the brick color I wanted. Also, the brick relief is fairly shallow on this building and I didn't want to lose it with a number of coats of paint. So it seemed that dry-brushing of some sort might work. I started with Accu-Flex R&RGW orange and lightly dry-brushed a small section of the brick. I wiped the brush on a paper towel in order to avoid getting too much paint on the surface of the brick. It took several passes of dry-brushing to get the color I wanted. I should mentioned that all of the trials of various colors and techniques took place on the back side of the roundhouse. And no, I won't be taking any pictures from the lift-out behind the building. I should also mentioned that all of the brick pieces were painted and weathered before they were assembled. More on this later. The grout in the photos taken at Hinton is a number of different colors. Some of it is black from years of soot and grime. Other portions are fairly light, perhaps the results of some tuckpointing repairs that took place over the years. And in some places, it seems to fade to the color of the brick. For the black areas, I tried several different techniques. I finally settled on a thin wash of Poly Scale grimy black. I applied it in some random areas and let it dry. The lighter grout was a real challenge. I've kept notes over the years of different techniques that I've used for grout and ones that I've found in magazines. None of them seemed to work. I finally stumbled across an article on using Durham's Water Putty for the grout. I tried a bit of it and it worked beautifully! There was nothing in the article about fixing it in place, so I thought I was finished. Then I dropped one of the test section of brick from about two inches above the workbench and most of the mortar came lose. Yikes! So I thought about ways to fix it in place. I tried applying water with a fine brush, allowing it to run into the mortar rather than soaking the surface, and it worked. The mortar stayed in place and the color remained. The photo below shows the final results. After the mortar had dried, I masked the brick and painted the foundation, the window sills and the tile wall caps with Vallejo Model Air Aged White. I went back and weathered these areas with a wash of artists acrylics using the Hinton photos as a guide. In order to the structure a slightly different look than the standard kit, I covered clerestory windows with Campbell Scale Models corrugated sheet metal siding. It was painted aluminum and then weathered using artists acrylics. The photo below shows the results. For whatever reason, I thought the inside wall on the back of the structure would be much more difficult to see. And in fact, you have to lean in a bit to get this view. But it would have helped the overall appearance to have added some color to the walls, perhaps some whitewash that was common back in the day. I would have also handled the windows differently. But it's time to move on, and I'll settle for using a Geep to hide it. There are still a lot of details to add to finish the scene, but it's very satisfying to finally have the main structure finished. One of the challenges of operating with car cards and waybills is finding somewhere convenient to work with them without damaging anything in the process. Many layout owners provide aprons to carry the cards but these are of limited use when it comes to actually working with them. Recently, a number of folks have started mounting vinyl carpet edging strips to the fascia in order to hold cards. The ones I have used have worked great, so I started looking for them online. It was more of a struggle than I thought it would be. As I searched for the strips, I came across a post on one of the forums where the layout owner had built a thin shelf pocket out of wood to hold the cards. He had painted the wood the same color as the fascia and it looked great. The one thing I seem to have plenty of is Masonite hardboard and small wood strips, so I thought I would follow his example. The photo below shows the first pocket along the fascia at North Pierce. This pocket is above the car cards boxes and allows the crew to work and sort the cards before placing them in the appropriate track boxes. 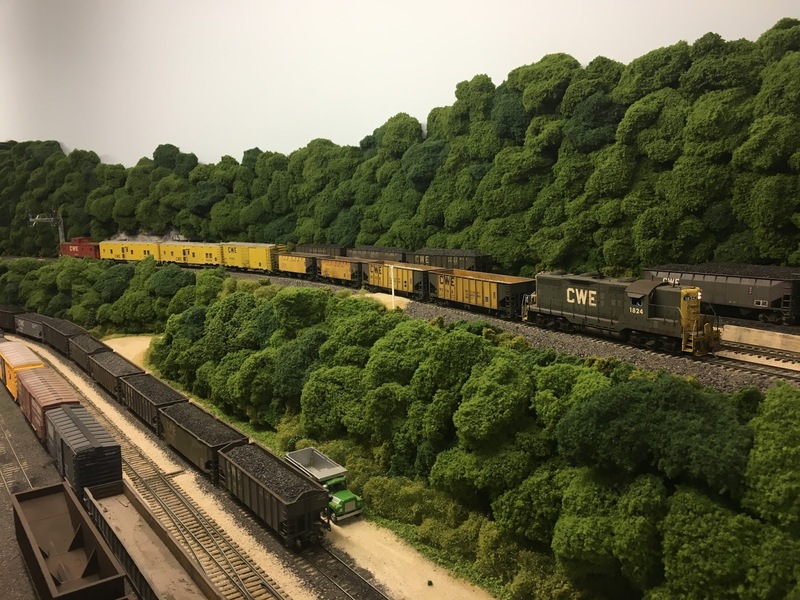 The yardmaster for Hollister Yard generally works the freight side from east end of the yard while the assistant yardmaster works the coal side from the location above. It occurred to me that another pocket would be helpful on the east end. The photo below shows this pocket. 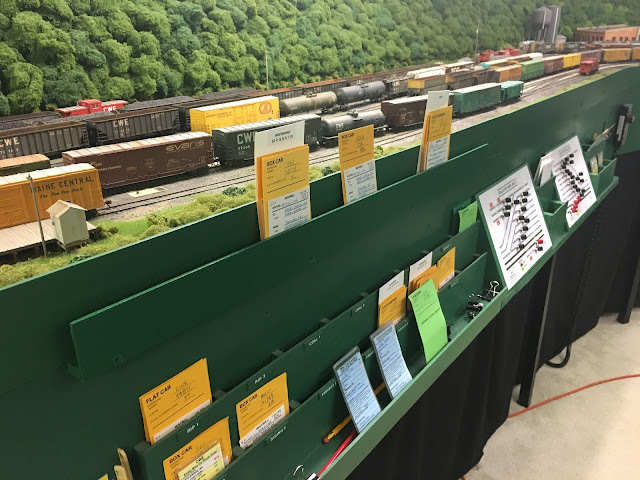 As can be seen in the photo, the yardmaster can tuck the classification index cards in behind the car cards to keep everything organized. Matt Snell, who usually works as yardmaster, mentioned that this new addition saved him a ton of time during the last session. In fact, it was Matt who came up with the idea of placing the classification index cards behind the car cards. While I was finishing up the last operating session, I was working NM-68 in North Pierce. While standing at the location above, I glanced over at the panel at SJ Cabin to see if I was lined correctly to pull from the yard. I had to walk over and check the alignment in order to do so. That is one of the drawbacks of pushbutton route control- you can't glance at the switch to determine how you are lined. It occurred to me that a simple solution would be to add LED indicators to the panel in order to show the route alignment. The photo below shows the new LED's. 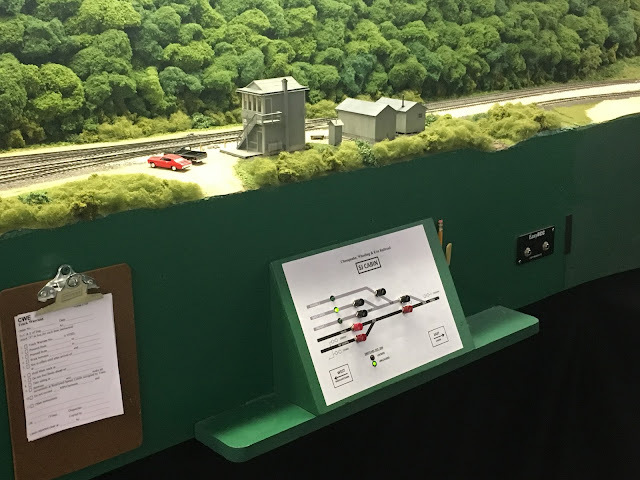 Now, a quick glance at the panels shows if you are lined for the coal side, the freight side or the lead to the engine terminal. Hopefully, this will make things a little easier for the crews.